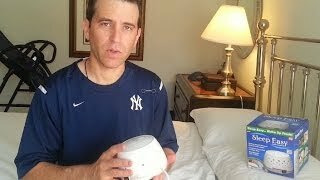 Sleep Easy is a revolutionary sound conditioner that can be used to help you fall asleep and stay asleep through the entire night. It produces white noise which mimics the sound of rushing air. This sound blocks background noises that can be responsible for interrupting your sleep. You can adjust the sound levels to suit your specific noise and sleeping situation. Sleep Easy has a convenient, compact design and includes a free AC adapter. You receive a bonus dream pillow which keeps its shape through out the night. You are guaranteed a full night of restful sleep without noisy interruptions. Sleep Easy can eliminate the need for sleeping pills and liquid sleep aids used to get a restful night’s sleep. This sound machine produces white noise that successfully blocks out unpleasant, sleep-disturbing sounds. It is a safe and natural way to sleep peacefully without being awakened by other sounds in your sleep environment. You will wake up feeling refreshed without sleep aids or earplugs. There are many noises that can disturb your sleep, such as, snoring, barking dogs, noisy neighbors, or dripping faucets. This small sound machine will keep those noises from keeping you awake. There is a 60 night money back guarantee to make certain the machine is working to help you get undisturbed rest and sleep. The cost of Sleep Easy is $29.99 plus $7.99 shipping. The special TV offer allows a free gift which you will receive by paying the extra shipping fee of $7.99 for a total price of $45.97. The Sleep Easy uses white noise to safely block disturbing noises that keep you awake. The sound levels are adjustable to suit your specific needs. Without disturbing noises that can wake you up throughout the night, you will have a more peaceful sleep. It works on a multitude of distracting noises. Insert batteries or plug in the machine. Is it safe to use the Sleep Easy Machine around pets and children? Yes, the Sleep Easy sound machine creates a soothing sound, which is safe for humans and animals. Will I be able to move it from room to room. Yes, the compact size makes the Sleep Easy portable. Will I have to constantly replace batteries in the machine? The sleep machine comes with an AC adapter, so it can be operated without batteries if desired. Can the Sleep Easy only be used at night? The Sleep Easy can be used to block out any disturbing noises during the day or at night.